Today the Tax Justice Network launches its 2013 Financial Secrecy Index, the biggest ever survey of global financial secrecy. This unique index combines a secrecy score with a weighting to create a ranking of the countries that most actively and aggressively promote secrecy in global finance. Click here: Financial Secrecy Index. Claims in September by British Prime Minister David Cameron that the UK havens are no longer a concern are baseless: our research demonstrates that while the British Virgin Islands, Cayman Islands and some other British jurisdictions have recently curbed some secrecy offerings, others have expanded theirs. [i] (See also our full narrative reports on the Cayman Islands, on Jersey and on the British Virgin Islands.) Table 1 below shows the extent of the gap between the political rhetoric and the on-the-ground reality of British tax havens (click on the table and accompanying key to enlarge). Our accompanying letter to Her Majesty The Queen highlights our concerns about Britain’s special role. 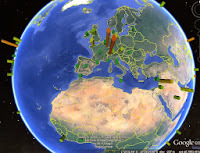 You can also explore our tax haven globe here. Our index, now expanded to cover 82 jurisdictions, also reveals how broader claims by the G20 and leading powers to have cracked down effectively on tax havens are bogus. While some welcome promises have been made and modest improvements seen, we remain light years away from seeing the transformative changes the world so urgently needs. Some positive trends are evident. With public tolerance for offshore financial secrecy having fallen sharply in many countries since our last index in 2011, we see potential for real political change: for example, citizens are demanding full disclosure in public registries of the beneficial owners that lie behind offshore shell companies, trusts, anstalts, foundations and so on. Secrecy comes in many flavours, and we have seen progress in some areas. 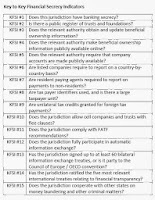 Crucially, automatic information exchange is now recognised as the effective global standard for tackling tax evasion, which was not the case when we published our last index in 2011. More countries are joining the OECD/Council of Europe Multilateral Tax Convention which, while flawed, is the first that could in principle benefit developing countries with automatic information exchange. Two useful multinational initiatives – notably the European Union’s Savings Tax Directive and the U.S.’ Foreign Account Tax Compliance Act (FATCA), both involving automatic information exchange - are making headway. Country by country reporting is gaining traction, particularly in Europe. But our index reveals that overall, financial secrecy remains alive and well. Switzerland retains a fully deserved top place in our index, unchanged from 2011. While it has made some concessions on financial secrecy, particularly to the U.S., these changes only pierce Swiss secrecy in narrow, limited ways. Switzerland has also been playing the spoiler, striving to block or derail emerging international transparency initiatives. Although Switzerland has signed more treaties allowing information exchange under the weak ‘on request’ model, it has often extracted painful concessions in exchange. Switzerland has, however, recently signed the Multilateral Tax Convention which, if ratified, would improve its secrecy score in future. Luxembourg is the dark horse of the offshore secrecy world. Offering a toxic cocktail of secrecy, tax loopholes and lax financial regulation, it is serviced by a huge offshore financial services industry and has recently been working with Switzerland to derail emerging European transparency initiatives. Its membership of the European Union keeps it off many tax haven blacklists and gives it a potent lobbying position in the world’s biggest single economic bloc. It has made some improvements, however, as the report explains. Hong Kong and Singapore, two rival fast-emerging Asian secrecy jurisdictions, have risen up our index, above all because of the rapid growth of their offshore industries. This expansion is principally due to economic growth in Asia, plus the displacement of some European and North American offshore activity eastwards, and the trend has happened in spite of welcome recent efforts by Singapore in particular to curb the full extent of its secrecy offerings. Both jurisdictions still have high secrecy scores, however. 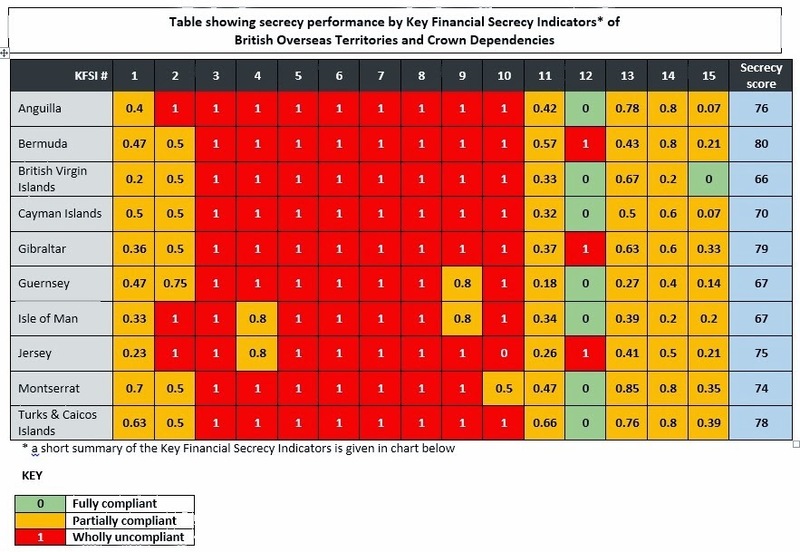 The Cayman Islands, part of the British network, has improved its secrecy score measurably after making some welcome moves on financial transparency. Significantly, its market share has risen even as its secrecy score has improved. Even so, Cayman remains a highly secretive jurisdiction where you can go to prison not just for revealing confidential information, but merely for asking for it. The United States, in sixth place on our index, remains a highly important secrecy jurisdiction, offering secrecy both at a Federal level and on the level of individual states. The U.S. has recently taken welcome action to protect itself against offshore secrecy, notably through its FATCA information-sharing project and its crackdown on Swiss bankers. But it has proven far less willing to reciprocate: reformers battling to curb the U.S.’ role as a secrecy jurisdiction have been facing immense resistance. Lebanon is a surprise newcomer to our top ten, having risen from 22nd place in our last index to seventh place in 2013. This change is because of a dramatic growth in Lebanon’s scale weighting, based on IMF data. The IMF has told us that this change is the fruit of improved and more comprehensive data collection. Although Lebanon’s share of offshore financial services is small by world standards, its secrecy score of 79 is very high, giving it a deservedly elevated position in our index. One to watch. Jersey has improved its secrecy score, buoyed by its participation in a rising tide of jurisdictions signing new international tax agreements that allow for some information exchange. 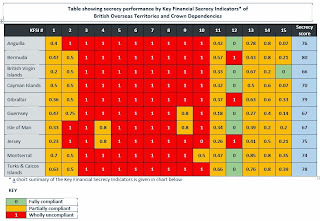 Yet Jersey’s secrecy score of 75 remains high by international standards, most importantly with respect to its unregistered offshore trusts and foundations. Germany and Japan are two other potentially surprising members of our top ten. Nevertheless, media stories and other sources indicate that these jurisdictions both host large illicit assets from other countries in conditions of secrecy. Germany’s and Japan’s secrecy scores of 59 and 61 respectively are comparable to the United States’ score of 58, but they are ranked below the U.S. because their international financial services industries are smaller. For the German readers among you, here is a link to a report on Secrecy Jurisdiction Germany. Why has my country ranking changed since 2011? Our Index reveals that Britain plays a key role in the global market for financial secrecy. The City of London uses a web of satellite secrecy jurisdictions based on British Crown Dependencies and Overseas Territories to channel huge illicit flows which feeds London’s mad property boom. Despite Prime Minister David Cameron’s encouraging commitments to tackle Britain’s tax havens, little has been done so far to rein in the menagerie of offshore trusts, foundations, shell companies, loopholes and subterfuges that make up the global secrecy system. Rolling back the secrecy that shrouds up to $32 trillion in offshore financial assets remains one of the great challenges of the 21st century. The yawning gap between fact and fiction in the fight over global financial transparency is only just starting to shrink. Important shifts – such as the European Union’s decision to curb one important aspect of banking secrecy from 2015 – mask waning momentum for other urgent changes elsewhere. Once again, our index shows how responsibility for protecting the world’s citizens from the scourge of offshore financial secrecy lies not with the ‘usual suspects’ in small Caribbean islands, but with big, powerful OECD countries. Our Index shows that too many jurisdictions still help tax evaders hide their identities and assets behind shells and smokescreens. 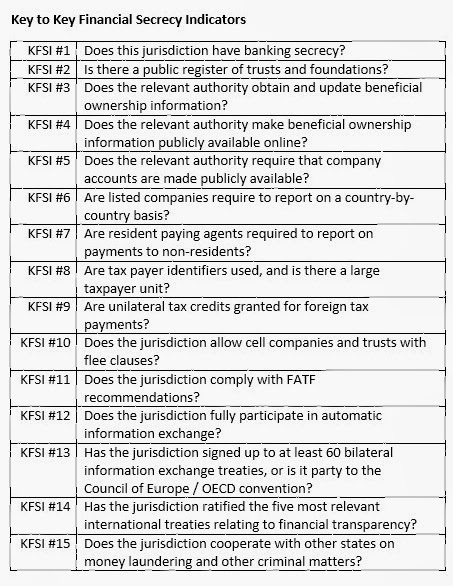 Without public disclosure of the beneficial owners of these assets, and the automatic exchange of information between jurisdictions to provide the information that law enforcement and tax authorities need, it will be impossible to tackle some of the world’s most pressing problems. Corruption, fraud, insider trading, tax evasion and avoidance, bribery: you name it, and the offshore system of financial secrecy is protecting it. Tackling this system pits the world’s citizens against one the most well-entrenched interest groups. And there is no interest group more rich and powerful than the rich and powerful, who are the biggest beneficiaries and protectors of this system. [i] For instance, Guernsey started offering foundations in January of this year.